Walking along the furrows of a plowed field after a rain is the best way to find artifacts, and there have been archaeological finds from Neolithic (Stone Age) farmers along the north side of Tjeldoya. There are photos of stone axes and spear points in the “Tjeldsund” booklet I mentioned in the last post. A wistful voice describes these 5000 year old finds. “Most of these artifacts have been found by farmers during the clearing and plowing of fields. Systematic investigations would provide a much more complete picture….” There don’t seem to have been many professional excavations in this region. Archaeologists probably come by only when a big grave turns up. 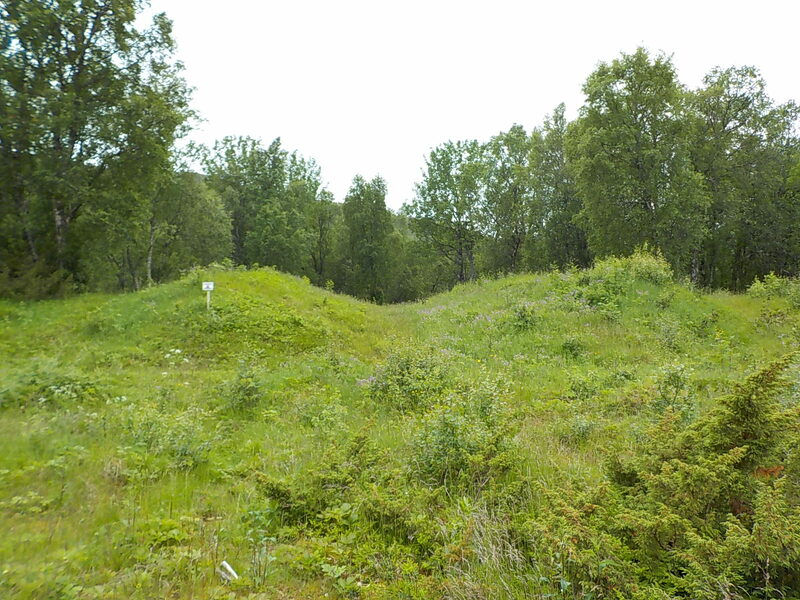 Dramatic archaeological finds are reported from graves in Ripelen, Sand, and Steinsvik, hamlets on Tjeldoya where burials from as early as AD 400 were found, extending into the Viking period and up through the ages. Best known among these is the Steinsvik sword, from an Iron Age grave (early 800s) that was found in 1902. 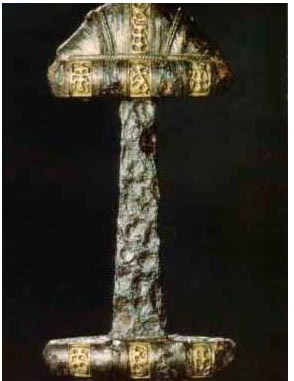 The sword is now in the archaeology museum in Oslo. The tomb also held this chieftain’s ax and spear, along with agricultural tools, knife and scissors, symbols of his leadership. The sword is on the left side of the left hand photo, before restoration. The right hand image is after restoration. It was difficult to find a photo–the right hand photo is from a tourist brochure. Sword collectors have a strong interest in the Steinsvik sword, and there are a number of recreations of it, but all the photos are copy-protected. The gold detail is of stylized animals and is part of the original sword. Another intriguing find is that of a woman buried with “knives, scissors, a key, a needle and a bone comb. To her dress was fastened a rare bronze figure of an animal, around her neck was a chain of 55 glass, amber and bronze pearls [beads], and 16 small shells.” The shells are the unusual part of the necklace because they are cowries. The nearest source of cowrie shells would have been the Mediterranean, indicating the distant reach of trade even in the 8th century, when the woman was buried. Of the archaeological sites mentioned, only one is clearly marked on the map and prepared for visitors, the Sand Viking Boathouse site. There is a small parking area and a marker, as well as a paved trail past the mounds that are the remains of a very large boathouse. This is considered significant, because a 40 m boathouse could house as large a Viking ship as has ever been found in Norway, suggesting an important person lived nearby. The large boathouse was later divided in two, for later, smaller boats. Each mound is one side of the boathouse. This is Lofotr, the 23.5 m replica Viking ship at the Viking Museum on Vestvågøy in the Lofoton chain. 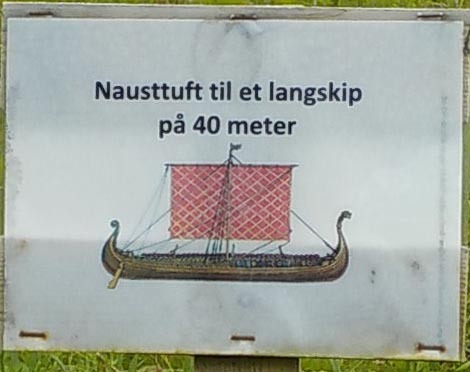 The boat housed in the Viking boathouse at Sand would have been almost twice as long as this one. A second boathouse foundation is from later, medieval times. 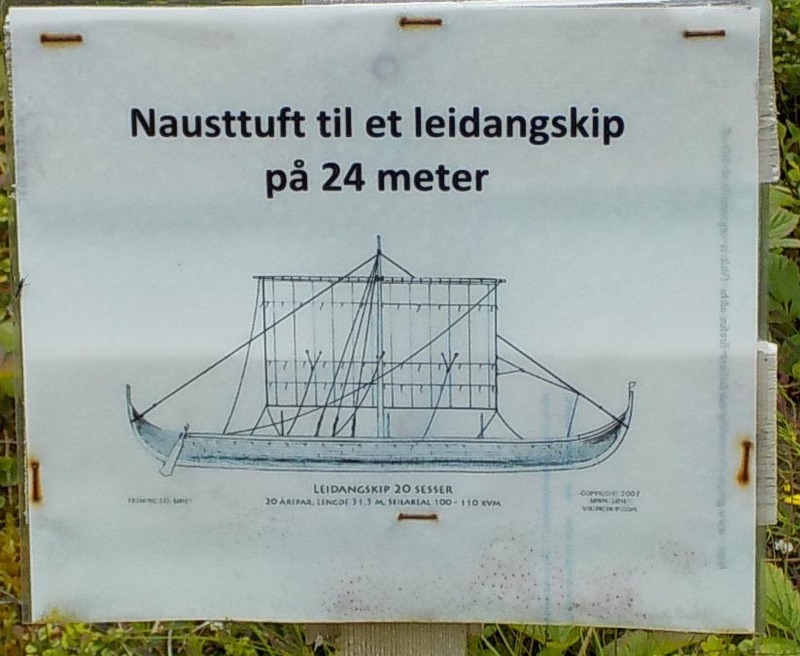 The boat kept here would be about the size of the Lofotr, shown above. 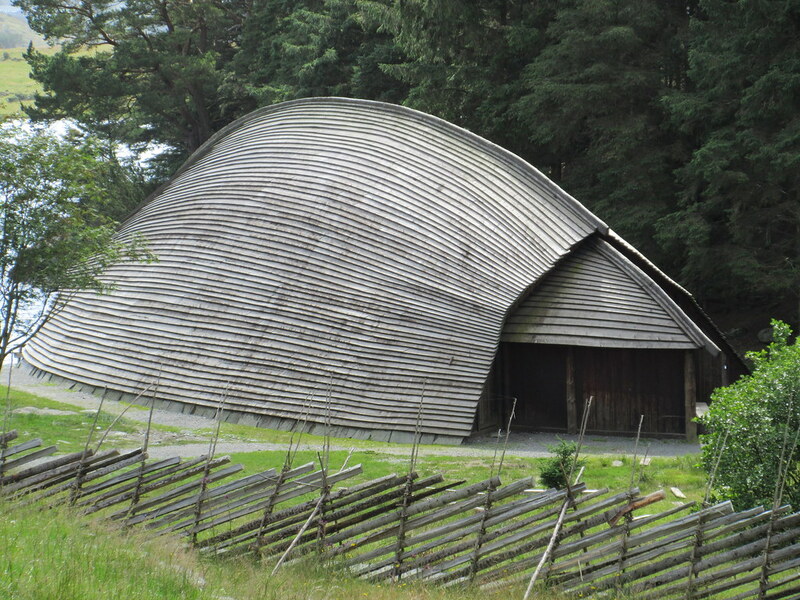 This is the reconstructed Viking boathouse in Avandsnes, Norway. The boathouse in Sand might not have been as elegant, but it would have been even larger than this one. These finds show you why Viking era archaeology can be so interesting, with large timber buildings. Even people who lived far from the main centers of trade obtained unusual objects. Though a village site might yield only remains of animals and a few tools, it also might have a few beads of Baltic amber or a shard of Roman glass.